Founded in the fall of 2014, Neighborhood Orchestra is a tuition-free after-school program open to any student grades 1 through 12. Neighborhood Orchestra uses a mix of traditional orchestral instruments (strings, woodwind, brass, percussion) and modern instruments such as drum kit, saxophone and guitar. Students also have opportunities to participate in chamber ensembles. Students perform in a variety of events and venues throughout the year including the YMF Community Arts Festival and YMF Family Arts Festival and other special events within the community. 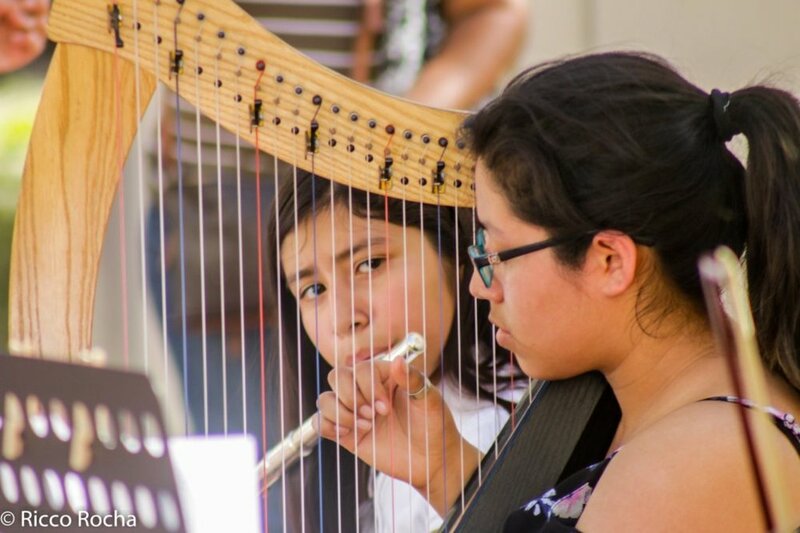 Past performance highlights include the Levitt Pavilion MacArthur Park’s L.A.’s Got Talent Youth Showcase and D’Addario Foundation Instrument Drive at the Ace Hotel. For younger students, we offer Recorder Ensemble for those with little or no prior music background. Students enrolled in the Neighborhood Orchestra program experience music in a variety of ways. Students participate in music theory classes through the Riko Methodology of theory, F.O.O.D., an immersive, game-based, hands-on approach to learning the fundamentals of music theory. Students in Neighborhood Orchestra also benefit from one-on-one and small group interactions with highly trained teaching artists and visiting artists from a wide range of musical backgrounds where students will receive guided mentorship in building ranging from artistic skill and ways to further explore and discover their creative voice to learning about the diverse range of careers in music. Students will also strengthen their critical thinking and creative problem solving, and enhance their level of communication and teamwork that they can carry into any aspect of their lives. When you join the YMF Neighborhood Orchestra, you are a part of a rich and growing family that will provide ongoing support through experiencing the joy of music. "My hopes are that my daughter continues to play violin. This experience definitely enlightened our whole family and will be one we talk about and look back on for some time to come. Thank you all so much for the awesome experience and opportunity. p.s. The concert rocked."